Each November in Burgundy, France, is a charity event known as the Hospices de Beaune, which is likely the greatest wine celebration in the world. Over the course of the weekend is the Clos Vougeot dinner, Paulée de Meursault BYOB lunch, and the world-famous wine auction where 100% of the bottles are donated, and 100% of the auction proceeds go to local charities. Last year, in the 152nd edition, sales totaled a record 5.9 million Euros, or 7.5 million USD- some serious drinking for a cause. It’s not surprising that many across the United States (New York, San Francisco, Aspen, …) have tried to pay homage to this great tradition of drinking and charitable giving. 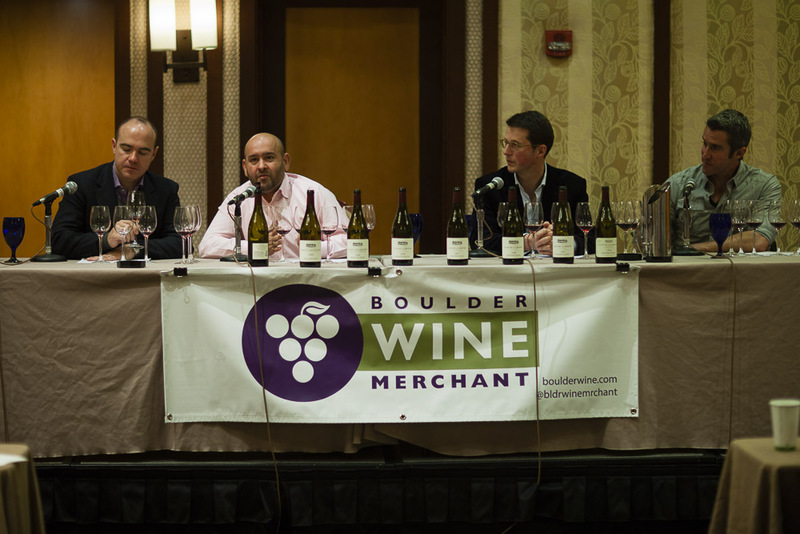 In 2011, Boulder joined in the fun, with the first Boulder Burgundy Festival, hosted by Master Sommelier Brett Zimmerman and the Boulder Wine Merchant. In the event’s two year history, all of the events have sold out, with proceeds going to the Growe Foundation, a local non-profit that educates our children on the benefits of healthy eating and environmental stewardship. The festivities kick off next Friday, October 18th with what is sure to be this year’s premier wine event in Colorado: a Domaine de la Romanée Conti dinner at the Flagstaff House. Other events include a Paulée inspired lunch at the Flagstaff House, a Burgundy dinner at Frasca, a seminar on Meursault, and the Grand Tasting. The Meursault seminar and Grand Tasting are the only events that have not yet sold out, but I anticipate that will occur sometime early next week. 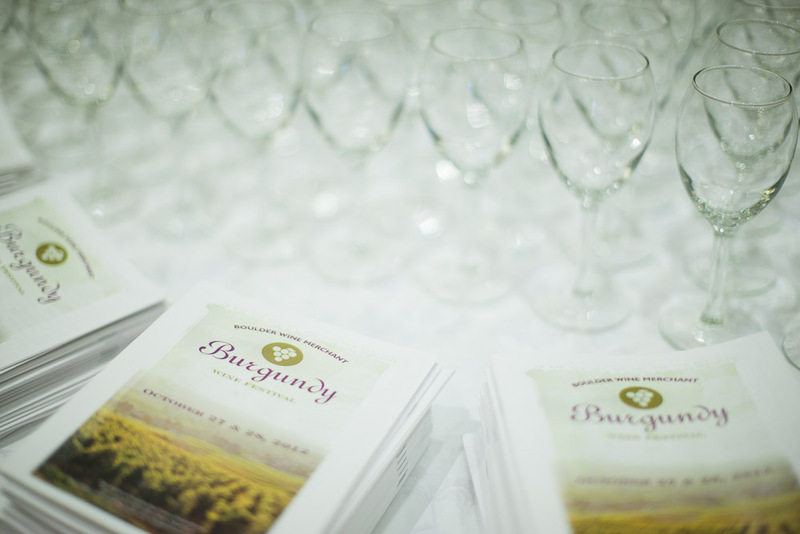 Both years, I have had the pleasure of attending the Grand Tastings, but even for a Burgundy enthusiast, the experience can be overwhelming, so I have written this article to help you get the most of out of this wonderful event. Many of the tips are applicable to any other extensive wine tasting event (think Aspen Food & Wine). The event runs 3 hours, and there are likely to be 15-20 different tables, with 5-10 unique wines, ranging in price (retail) from $15-$300/bottle (average price is probably $75/bottle). Typical pour volumes for a tasting are a half ounce. If you stay for the duration of the event and try one wine every 5 minutes, you’ll have tried 36 wines or consumed 18 ounces of wine. There are 25.4 ounces in a standard bottle of wine, so the retail value of the wine you have consumed is (18/25.4)*$75 = $53. However, very few of us are likely to purchase a $200 bottle of Grand Cru Montrachet, so there is the intangible pleasure of being able to try these wines when you otherwise would not buy. Also remember that it goes to charity and in the past has been tax deductible. If you drink according to the scenario above, you’ll have consumed 3/4s of a bottle of wine, which is enough to make most people comfortably numb. My go-to meal before something like this is a Chipotle burrito- lots of alcohol absorbing carbs. But choose something that is mild in flavor. You do not want to ruin your palate with something insanely spicy, acidic, or sweet. Ok, so now that we’ve planned out the logistics, on to the fun stuff! For all intents and purposes, there are only 3 grapes grown in Burgundy that you will see at the tasting. 90-95% of the wines will either be Pinot Noir or Chardonnay. The remainder will be Gamay (Beaujolais). The highest quality wines come from the Côte d’Or which is divided into two swaths where wine is grown. The northern half is known as the Côte de Nuits, and is best known for Pinot Noir production in the villages of Gevrey-Chambertin, Vosne-Romanée, and Nuits-St-Georges (among others). The southern half of the Côte d’Or is the Côte de Beaune, which contains the villages of Meursault, Puligny-Montrachet, and Chassagne-Montrachet which are most famous for Chardonnay. The Côte de Beaune also is home to some villages that are famous for Pinot Noir, like Pommard, and Volnay. South of the Côte d’Or is the Côte Chalonnaise, which is home to value reds such as Givry, Mercurey, and Rully. Further south from this, is the Mâconnais area where “value” Chardonnay is grown (St Véran, Pouilly-Fuissé, etc.) Northwest of the Côte d’Or is Chablis, which is world-famous for Chardonnay. There is a definite hierarchy to wine production in Burgundy and it contains 5 levels. These are listed in descending order of quality. However, the lines are fuzzy, and some Premier Crus are better than Grand Crus. I’ve had a number of non-classified single vineyard wines that are, in my opinion, quite a bit more refined compared with their Premier Cru counterparts. But it is a a good rule of thumb to adhere by. Grand Cru– All of the grapes originate from a single vineyard that is designated as “Grand Cru” status. The title “Grand Cru” is bestowed upon vineyards with only the finest soil, sun exposure, and other vineyard characteristics. There are 33 areas that possess this status, constituting 2% of total Burgundian wine production. Within a given Grand Cru, there are several vineyards that adhere to these standards. So for instance in the Grand Cru appellation of Corton, there are 11 unique vineyards. Premier Cru– All of the grapes originate from vineyards that are designated as “Premier Cru” or “1er Cru”. However, some Premier Cru wines are blends from multiple Premier Cru vineyards. There are 635 Premier Cru vineyards that possess this status, which represents 12% of total Burgundian wine production. On the wine label, in the producer will often list the vineyard(s) that were used along with the “1er Cru” designation. Single Vineyard– Often the name of the vineyard is listed on the label, but since the vineyard is not classified with either Premier Cru or Grand Cru status, they are unable to advertise it as any more than this. These are often located in vineyards that are in close proximity to these classified vineyards and can have characteristics that very closely resemble their more aristocratic neighbors. Village Level– We have reached the point where the wines are blends of several vineyards, however, the grapes are all sourced from a relatively small region within Burgundy. Depending on the producer, this is often where you start to see regional characteristics. For instance, for a wine to be called Meursault, all of the grapes would have to be sourced from any of the numerous vineyards in Meursault, whether they are Premier Cru or an outlying vineyard. Generic– When you see a Burgundian wine that says “Bourgogne,” it means that it can be a blend from whatever vineyards the producer chooses. A ballroom full of tables of wine can be paralyzing, so before you do anything, open the guidebook that lists the tables and their various wines. Producer is key in Burgundy, and single vineyard Pommard from Louis Jadot is going to be completely different from a Pommard from Domaine de Montille. Without giving away all of my secrets, I can tell you that if they are present, as they have been the last 2 years, the first table I will be visiting will be Domaine de Montille. It’s also important to keep in mind that the distributors who are present are going to have fewer bottles of their Grand Crus on hand compared to Village and generic level wines. Many tables wont have any at all. So if there is a special wine that you really, really want to try, do it relatively early (before 3:30). Try to identify your top 2 or 3 tables right away so that you will be tasting your favorites while they are still available, and while you are still sober! Once you have approached a table, received your pour, and listened to the information about the wine it is time to taste! Before you do anything, particularly at your first couple of tables, swirl the glass a few times to give it some air. It’s not meant to be pretentious, but remember that it isn’t a science fair vortex experiment. After a few twirls, put your nose in the glass, take a moderate sniff of the wine, and give yourself 45-60 seconds to think about your impressions about the wine. There is absolutely no point in putting your nose back in the glass any sooner. Period. When you smell something with strong aromas, and at close proximity, the olfactory nerves (in your nose), will be saturated and succumb to what is called “olfactory fatigue.” What is essentially happening, is that the olfactory receptors (located on small hairlike cilia) are completely covered with the molecules that give the wine its smell. For this reason, you need to let these molecules dissipate from your nose before smelling again. So after you’ve given yourself a minute to consider the first impressions, smell it again, and then taste the wine. You’ll get more out of each taste and smell that way. Hopefully you aren’t saying “duh” each time you read these bullets, but this one is easy to forget in the heat of the moment. The program is tricky because there is something of an incentive for you to taste the highest price wines since you might not otherwise have them. For instance, if you are finding that you really like Puligny-Montrachet and its rich, mushroom aromas, but are on a graduate student budget, be sure that you try some of the cheaper Chardonnays at the generic or village-level. How often are you going to have the opportunity to taste these two wines side by side that are an order of magnitude different in price? If you like a particular style, you can try and find a wine that has similar characteristics that you can actually afford to drink on a regular basis. Similarly, if something knocks your socks off, make note of it as such! In my own mind, I like to categorize wines into categories as to how often I could drink them in order of fiscal responsibility. Everyday wines, once a month wines, special occasion wines, once a year wines, and deathbed wines. 9- But order what you want! The Burgundy festival may be the one time of the year that I find myself getting sick of drinking Savigny-les-Beaune. It’s a good problem to have. But carpe diem et carpe vinum! Don’t feel obliged to have a particular wine just because it is the next wine that the distributor or producer recommends. In fact, you should feel comfortable ordering à la carte, particularly towards the end of the event when the tables are trying to finish the bottles of their higher end wines. However, this is easier said than done, particularly when you don’t know which wines are white or red, let alone to pronounce them. So I’ll give a few tips to pronounce some of the finer Burgundian wines that you are likely to see over and over again. I’m not a linguist, so my pronunciations are phonetic. When in doubt, just don’t pronounce the final consonant. Charlie is one of the funniest and least pretentious people working in the Boulder wine industry and will hopefully be in attendance at the Volio Vino table. Whether you drink Burgundy exclusively, or never have before in your life, you can learn something from him. If you get sidetracked with a 5 minute anecdote about the perverse origins of a wine label, keep listening, it’ll be worth it. I hope that these 10 tips can optimize your tasting experience! But when in doubt, strike up a conversation with one of the many sommeliers that will be roaming the room and remember that the only thing better than drinking a fine wine is sharing it with others. With that, I hope to clink a glass with many of you next weekend! Santé! Next Next post: Volta Knows Best?